All of us daily receive or send different messages to each others either in a group or a single person. Lot of time the storage space of your Android phone is full with lot of WhatsApp images and videos. This article helps you to provide quick way to delete useless photos from WhatsApp automatically. With the help of WhatsApp you will be able to quickly send or receive any kind of text, audio and video messages each others on your Android phone. WhatsApp occupied lot of space on your Android phone. There are lot of person added in your contact list and most of the person’s use WhatsApp in his Android phone. It’s is not the right way to block any contact person who is daily sending you lot of WhatsApp messages and video. If you delete one by one all useless photos from WhatsApp images folder it will consume lot of time. After reading this article you will be able to easily and quickly delete useless photos from WhatsApp automatically. The Siftr labs launch his latest Android Magic cleaner for WhatsApp tool. The Magic cleaner allows you to quickly scan the media folder of your WhatsApp. After complete the scanning process it will detects all the unwanted images, videos and other things . After that you will be able to quickly delete all useless photos from WhatsApp automatically. Just like Google’s image recognition API, siftr lab also developed his own image recognition engine that check all the images, videos and other things that they are junk or not. It is an interesting app which smartly separate all the junk images, videos and then quickly remove them in a single tap. 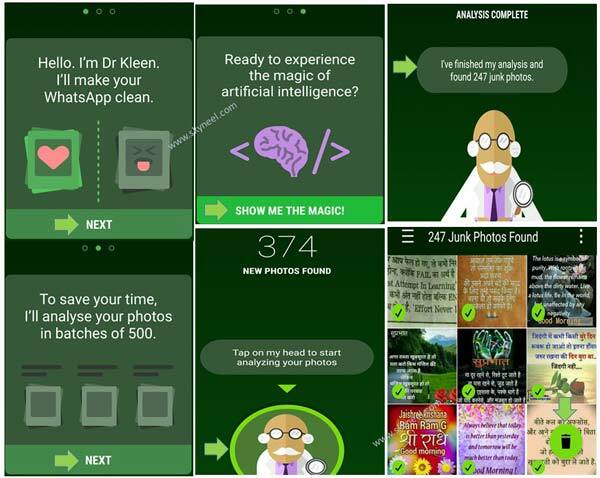 The Magic cleaner for WhatsApp will automatically analyse all the junk images from your WhatsApp media folder. It need an active Internet connection which send images to the cloud for analysis and return back within a short period. After that you’ll be able to easily and delete useless photos from WhatsApp automatically. This app occupied 8.5 MB space on your storage area. If you want to download this app then you need 4.0.3 or upper version of Android phone. The users gives 4.4 star ratings of this app. Step 1: Download and install Magic cleaner for WhatsApp on your Android phone. Step 2: Tap on the Magic cleaner for WhatsApp on your Android phone. Tap on the next button > again tap on the next button. Step 3: Tap on the “show me the magic!” button. Tap on the start button to analyzing your photos. It will automatically identify all junk photos, greetings and memes. Now, all junk photo analysis process is being started on your Android phone. It will take some time to identify junk photos from your Android phone. Step 4: This app automatically select all junk photos. If you want to immediately delete all the junk photos, greetings & memes then tap on the delete button. You can also remove selection from all those photos which you don’t want to delete. This article is useful for all those guys who want to know the quick way to delete useless photos from WhatsApp automatically. After reading this article you will be able to delete useless photos, greetings and memes from WhatsApp automatically. If you have any suggestion regarding this article then write us in the comment box. Thanks to all.